I confess to only hearing about Uncle Wiggly just recently. My introduction came from Winning Moves who asked if I'd be interested in reviewing another of their products. 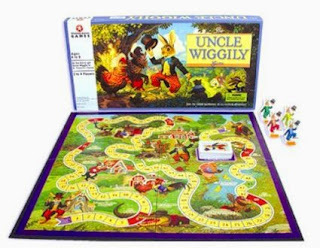 I saw the Uncle Wiggily Game and thought the kids would find it rather cute. (They did. But more about that in a minute.) Then some friends mentioned that they were reading The Uncle Wiggly stories. Well then. Stories. I had to look them up. At about the same time I decided to check out Uncle Wiggly, I started looking into Jim Weiss audio stories. I noticed that - in his vast collection of stories - he had performed Uncle Wiggly's Storybook which contains six stories. We snatched that one up on Amazon (MP3) and gave a listen. The kids absolutely loved Uncle Wiggly (and we have been very impressed with the reading performance of Jim Weiss). I plan on sharing more about Jim Weiss next week because we've really been enjoying him! This post, however, is mostly about the Uncle Wiggily Game . Before I tell you about that, I have to tell you about the character himself just in case you are as new to him as I am. Uncle Wiggly Longears is the creation of American author Howard R. Garis. 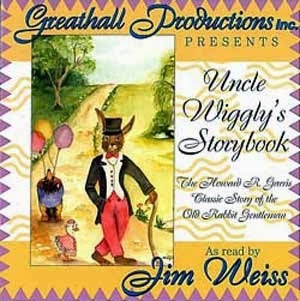 He wrote stories about Uncle Wiggly every day for thirty years beginning in 1910. (Every day for thirty years, excepting Sundays!) Garis had 79 books published in his lifetime. Uncle Wiggly is the main character of these stories but there are a variety of animals who make an appearance. They are quite fun stories, simple but entertaining. As I mentioned, our kids have loved listening to them. I withheld the game until we had become familiar with the characters. That was a good move and made playing the game much more interesting to them. However, you really don't need an in-depth understanding of these books to enjoy the game. The game was developed in 1916 by the Milton-Bradley company, once Uncle Wiggly had endeared himself to American children. This game plays much like Candyland, which is not altogether surprising as the two games together are listed as American children classics. (However, The Uncle Wiggly Game appeared on the scenes about 30 years prior to the arrival of Candyland.) The Uncle Wiggly game was revised and updated several times, increasing in price no doubt also. In 1947 the game cost a whopping $0.67! You can find in Amazon now for $13.95 . The game itself is very simple and easy to play. Just like in Candyland, the players are each moving in spaces by the turn of a card. Instead of colors, you move by drawing a card and moving the appropriate amount of numbered spaces. Each card has a little rhyme on it, in keeping with the rhymes/witty statements at the conclusion of each story. There are traps for the animals causing you to have to fall back some spaces if you land on them. Every so often a card will pop up which will bring Uncle Wiggly to a rest so that he can enjoy a cup of tea and this card will also send your player back some spaces. On the whole, I think this game is very cute. Parents will be interested to note that it takes a total of 15-20 minutes to play. This game is excellent for ages 3-7 and I think it's a pretty fun way to compliment the stories. Happily, I have been given permission from Winning Moves to host a giveaway allowing one of you to win a copy of the Uncle Wiggly game. If you'd care to win, simply leave a comment below. This contest is open to US Residents only and will be open through Friday, September 5th. Please do remember to leave a valid e-mail address in your comment! Many thanks to Winning Moves for prompting me to learn more about this character in the first place, and for providing a fun and entertaining way to enjoy him more thoroughly with my kids. I recieived a copy of this game in order to facilitate this review. I received no additional compensation and all opinions are my own. I loved Uncle Wiggly as a kid, and my children have enjoyed him, too. The game sounds like fun!